10.00-18.00 – Blessing of the animals at the Rasin multifunctional centre – farmers festival with games and fun for kids and lectures. 19.30 – Dinner at the Rasin multifunctional centre, followed by a dancing night. 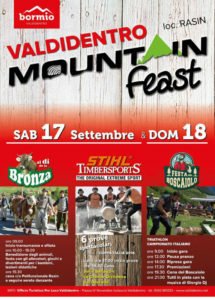 In the meanwhile, the Palio among the social associations in Valdidentro will be held: many funny trials. all day long, you’ll find gorgeus roasted pork and challenging cards tournaments. The lumberjack fest will be held at theRasin multifunctional centre. kids will enjoy themselves with inflatable games and amusements. There will be artists working with chisels and chainsaws who will create wooden sculptures alive.